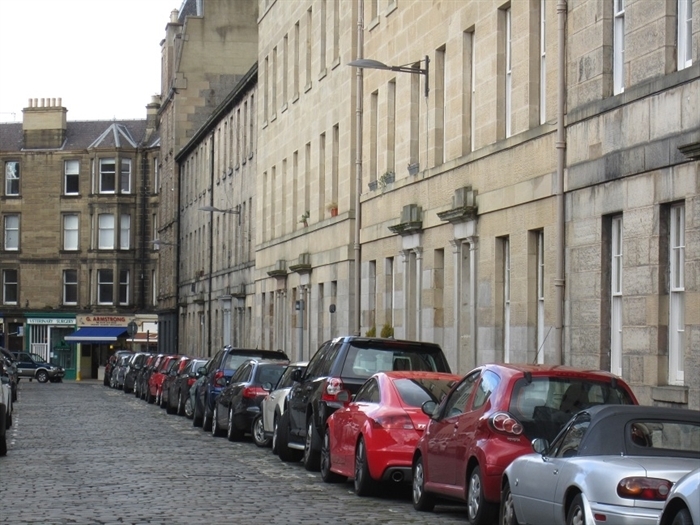 Cheyne Street adjoins Raeburn Place, the main thoroughfare of Stockbridge from the New Town, and is far enough away to avoid the sound of morning traffic. Stockbridge itself was voted the best place to live in Scotland, and here you’ll find a wealth of great restaurants including Tom Kitchen’s Scran & Scallie Bistro, a really good selection of pubs, cafes, delis, and art and craft shops, as well as many charity shops where you can pick up some bargains. Waitrose is just over five minutes’ walk away while Sainsbury’s and Scotmid supermarkets are even closer. A few minutes’ walk will also take you to The Stockbridge Farmer’s Market, held every Sunday under the trees close to the Waters of Leith. Edinburgh’s renowned and free Royal Botanic Garden is mere minutes’ away, just beyond the sweeping Inverleith Park and Pond, home to ducks and swans. A walk to Princes Street through the beautiful New Town will take about fifteen minutes and there is an excellent local bus service if you want to go farther afield. 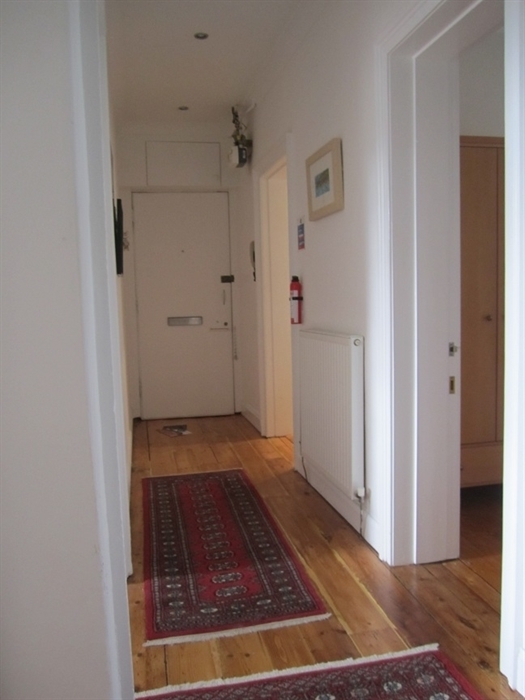 The apartment is on the first floor and has a simple layout, with three rooms on either side of the central lobby and the bathroom off the end. 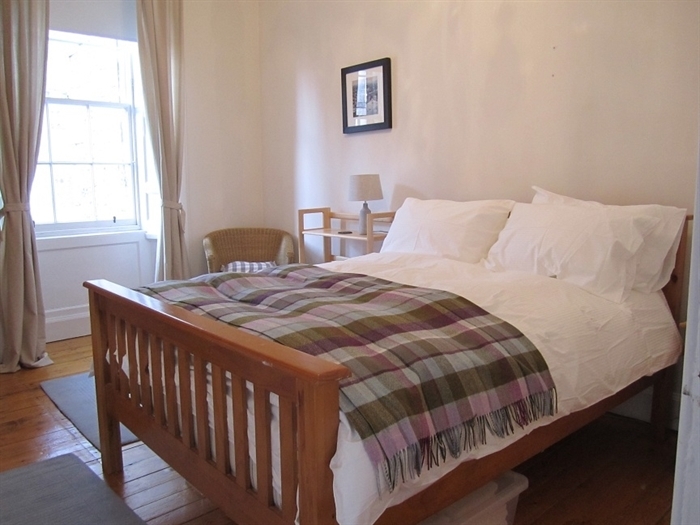 The décor is light and bright, conveying a sense of space, and artwork of Edinburgh features throughout, so the property has a local and authentic feel. 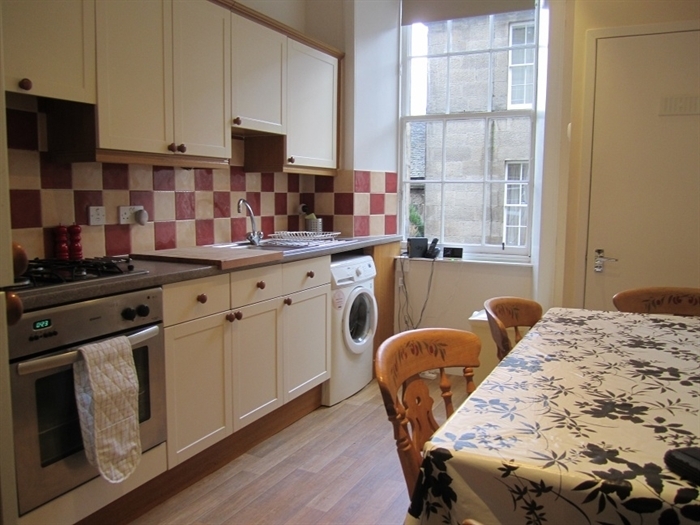 The kitchen is first off the left, and like its two neighbours has a window overlooking the quiet shrub-lined and cobbled lane of Raeburn Street. The kitchen is well equipped with pots and pans, all the crockery and dishes you would expect to find at home, and a large wooden dining table seating six. 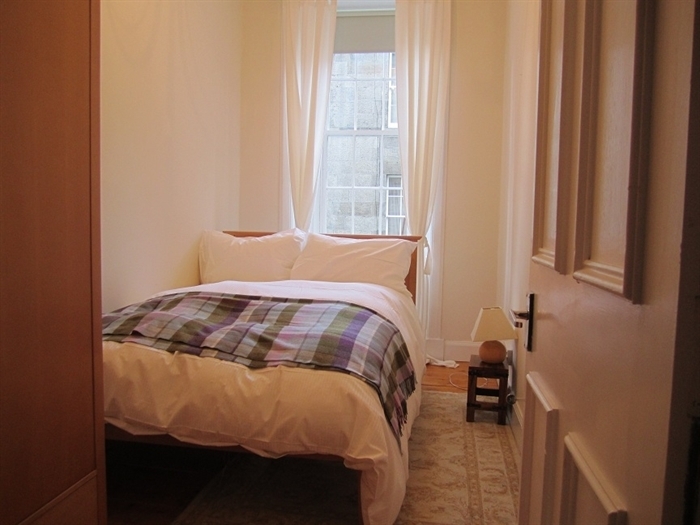 All three bedrooms have double beds and ample hanging and storage space in the wardrobes and drawers. The master bedroom’s window looks out along Dean Street. In between these bedrooms is the modern tiled bathroom, which has a fitted bath with fixed and flexible shower heads, a heated towel rail, and an adjacent cabinet, equal in height to the door in front of it. 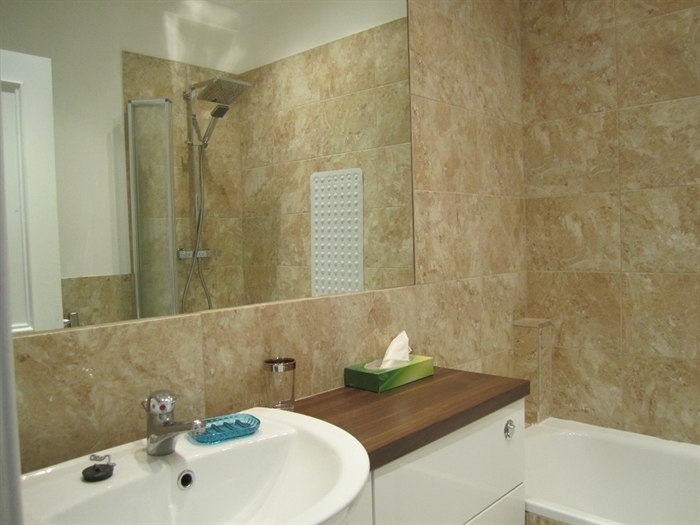 The tiles here are a sand colour, so the room has a warm, inviting hue. The living room has two large windows facing west and catches the afternoon and evening sun. 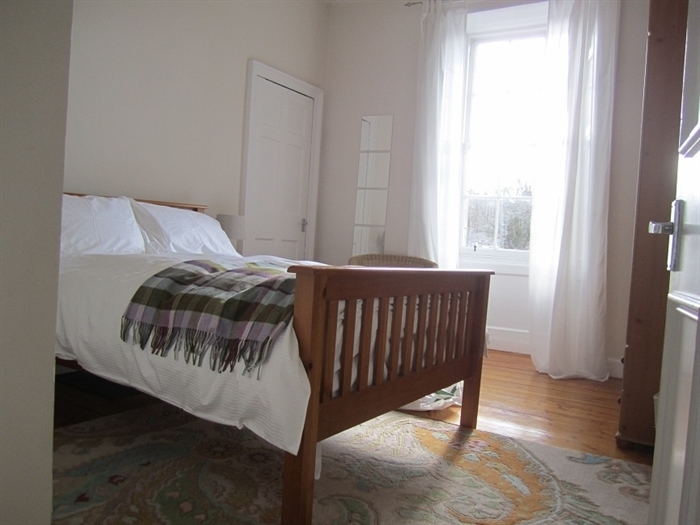 Like the rest of the apartment it retains many original features including working shutters, traditional cornice and fireplace. As there are two sofas and plentiful seating for six or more guests, this room makes a great entertainment and relaxation space. There is also a communal garden at the back of the property. Cheyne Street is a compact and comfortable apartment which makes for a comprehensive offering; you have everything you need here, from space to cook, sleep, wash, and relax or entertain guests, all in comfort and style. 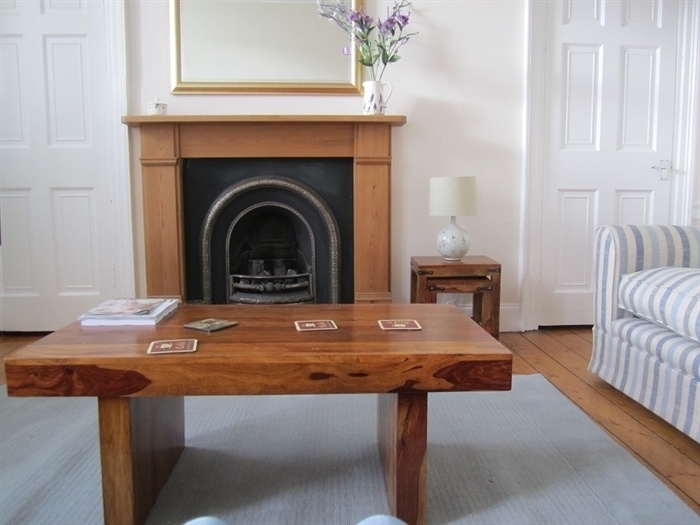 The apartment’s location in one of Edinburgh’s most popular districts is an added boon.